For all of its stumbles into Em’s all-too-common crutches, however, Recovery is at the very least showing signs of maturity amongst raps that are as skilled as anything he’s done since The Marshall Mathers LP. The songs where he attempts to reiterate his past glories are arguably the biggest failures of all. The album is a sprawling, confusing, self-indulgent mess. 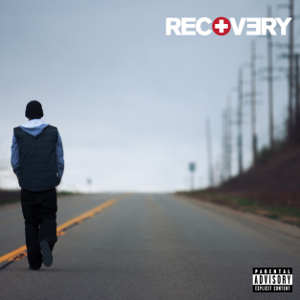 For the average listener, Recovery will prove to be a very stale and disposable record; for the discerning Eminem fan, a sad and unwitting betrayal. Eminem spends nearly half of Recovery insisting he's the best rapper alive, but for the first time in his career, he actually sounds clumsy. Purchasing Recovery from Amazon helps support Album of the Year. Or consider a donation?